Hawaii is absolutely the most magical place in the world. I have never traveled somewhere where I felt so complete and at peace. 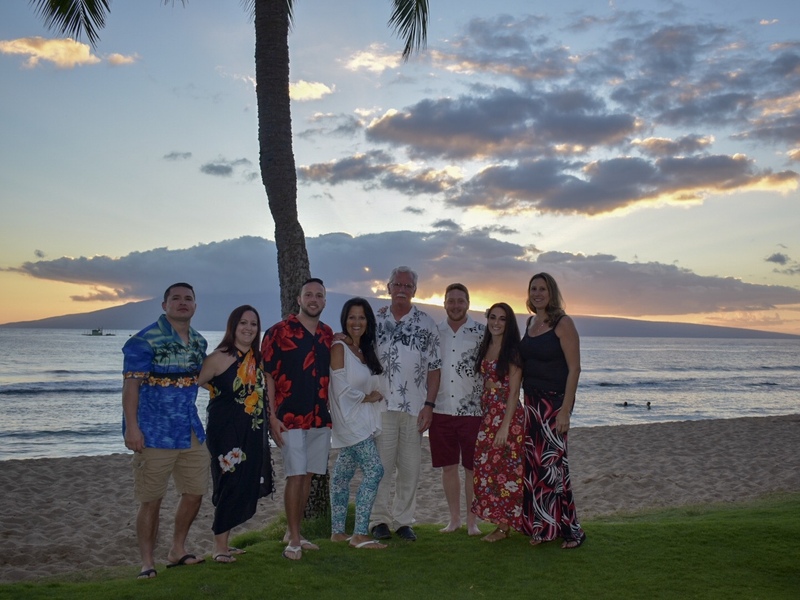 Keep reading to hear about all we did while we visited the beautiful island of Maui (warning, this is a picture heavy post!). The resort we stayed at was absolutely stunning! We stayed at the Hyatt Residence Club which has the most beautiful views. The room we were in had the most gorgeous ocean view from the balcony. Every morning we sat and had our coffee out there as well as each evening we admired the gorgeous sunset. Hawaii has some of the most incredible sunsets that I have ever seen. This resort had many pools and hot tubs surrounded by flowers and trees. It honestly looked like a tropical rainforest! The beach was also amazing as you could snorkel right off the beach and see the coolest fish. We even saw sea turtles on our last day! We didn't go out much while here as we had a full kitchen in the room but we did go to a few places that I just loved! My favorite breakfast spot was Ka'anapali Grille, this was a 2 minute walk from the resort and we loved it so much we ate here 4 times! Everyone we went with was obsessed with the french toast, it was sooo good! I kept stealing bites of my husbands because I ordered the avocado toast which was also so incredibly delicious. We literally ordered the same meal each time as we couldn't get enough! Another favorite of ours was the POG mimosa. POG is a Hawaii staple (its passionfruit, orange, guava juice). This is something I wish we could pick up at our grocery stores here because it is that good. One night we decided to go out to Lahina, which is the town near by. They have a bunch of shops, restaurants, and bars with a little something for everyone. We ate dinner at Down the Hatch and ate the best tacos I think I have ever had. I got the baja tacos and I still think about them every day! This restaurant kind of reminded me of a surf taco. You go up, place your order and they bring the food to the table. There is also a bar if you want to get a few cocktails and hang out. I will talk more about this later, but on a day trip to Lanai (one of the other islands) we ate at the restaurant at the Four Seasons resort. The food here was absolutely incredible and you definitely can't beat the views! I had the grilled cheese panini with avocado and bacon, because who doesn't love avocado and bacon?! This was one of my favorite meals from the trip. Besides the pool and beach, we did a few other activities that I just loved! Early in the week we did a sunset whale watching cruise that was awesome. Near our resort was an outdoor shopping mall that had a few stands to sign up for these activities at. They offer whale watching cruises during the day as well. They include drinks and light bites and of course you get to see the beauty of Hawaii from the water. I loved getting to see the whales! Although we only saw two, it was still a really cool experience. Of course my husband and I had to re-enact the titanic, because well why not? We got up early one morning to do paddle boarding which I had never done before (fun fact I use to surf!) and had the best time. I was afraid the water was going to be cold but it was so warm. Unlike here in Jersey, the water is completely clear and this time of year you don't have to worry about sharks. This is another activity we did out of Whalers Village and it was only 35$ for the hour and 10$ for each additional hour. From here you can paddle down to what they call Black Rock which is this small cliff that people climb up and jump into the water from. I personally didn't partake in this but my husband and friends did and loved it! The stand we did this out of also had surf lessons if this is something you want to give a try! This was one of my favorite activities from the trip! 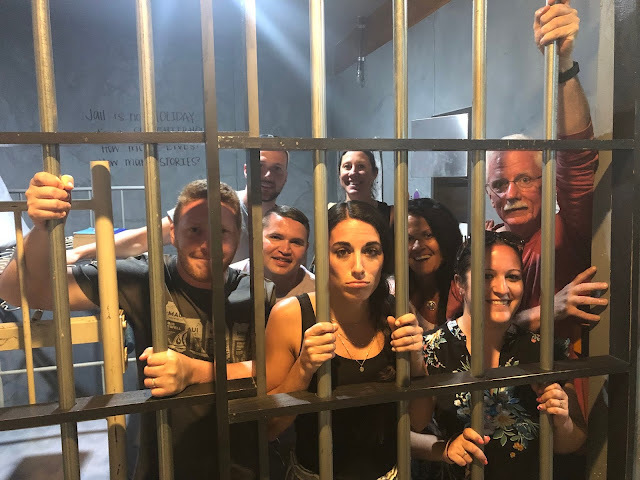 Our entire group went in the late afternoon and did a "prison break" escape room. If you haven't done an escape room before you totally should! They are so fun! This room allowed up to 10 people if you are going with a big group. After we got use to the time change, we decided we would try going out one night instead of falling asleep by 9:30. As I mentioned earlier, we ate here at Down the Hatch the night we went out. We did some light shopping around town and went to a bar called The Dirty Monkey for some drinks and dancing. There are a ton of options here so if you don't like one bar you can go to another! Lanai is another island of Hawaii, but it has a small population. The city is tiny (which we didn't visit) but they have this beautiful beach that you can take a ferry to. We took the ferry from Lahina which is a short drive from the resort we stayed at. The ferry ride is about 45 minutes but worth the trip. The beach here has these amazing tide pools that you can walk around and see all of the little fish swimming in. There's also a path that leads all the way up to the top of this really tall cliff with the most incredible views! It was a little scary but the view was totally worth the climb. If you do visit this island, be sure to bring some snorkel gear. The fish here are just stunning! Last but certainly not least, my outfits from the trip! I did end up wearing a lot of things I already had as shopping for Summer items in the winter is next to impossible. I was able to find two really cute bikinis, but other than that I struggled to find new items to bring with me. I did link the ones that are still available! Overall, I just adore Hawaii! This trip will always hold a special place in my heart. We made some amazing memories here with some of the best people we know. We were all so sad to leave this beautiful place, but the memories will last a life time. If you ever get the chance to go to Hawaii, do it! The flight for us was long but worth every minute. It really is the most magical place I have ever been! Feel free to send me any questions you have about the trip, I would be more then happy to answer! Nice post and thank you for sharing. Have you tried the whale watching in Bermuda? You can check the best travel tour operator on the Island. They offer lots of activities and tour in Bermuda.